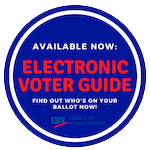 The League is a nonpartisan, political, grassroots organization of volunteers working for democracy through voter education, issue advocacy and civic participation. LWVH includes the town(ships) of Southampton and East hampton on Long Island's South Fork. We also welcome new members living on the North Fork where no League is established as yet. National, state and local elections. Who can vote? Informative websites. 2018 Directory of Public Officials. National Studies. Statewide Studies. LWVUS Studies. 2019 Annual Meeting material, Recent and Future Events. The Voter, our award-winning newsletter, is published seven times yearly. The League of Women Voters of the Hamptons (LWVH) hopes that members (and potential members) as well as non-members visit frequently. You'll find information about registration and voting, our activities, committees and meetings. The League is non-partisan -- we never support or oppose any political party or candidate for elective office. But we are political. Members are encouraged to fully take part in the political process. We hope that as you get to know us through this site, you'll consider joining us in person! The public is invited to attend all general League meetings. Check out our Calendar for scheduled events. Many thanks to these businesses who support our award-winning Voter through their advertising. Please help us show our appreciation by checking the directory whenever you need a service or product from air conditioning to yoga! Disclaimer: All links to other web sites are provided for your convenience only. The League of Women Voters of the Hamptons exercises no control of the information or opinions contained on them. Provision of these links on our site does not indicate an endorsement of their contents by the LWV of the Hamptons. Last revised: April 8, 2019 15:39 PDT.